Jordan Siev, an attorney for Meek Mill, discussed the rapper’s case with Angie Martinez. 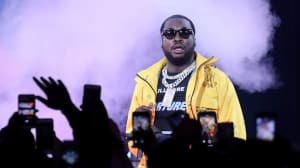 A member of Meek Mill's legal team spoke with Angie Martinez on Power 105.1 to discuss the Philadelphia rapper's case. Jordan Siev is one of the attorneys attempting to prove that Judge Genece Brinkley's two to four year prison sentence for Meek Mill was biased, a charge undermined by recent news stories which claim that Judge Brinkley is vindicated by court transcripts. However, Siev claims that the reports relied on incomplete information. Siev says the first motion Meek's legal team filed for Judge Brinkley's recusal was due to "an unusual interest in [Meek Mill's] career." Reading from transcripts, Siev says that Brinkley repeatedly and unfavorably compared Meek's management with Roc Nation to Charlie Mack, who Meek fired in 2011. Joe Tacopina, another lawyer for Meek Mill, told Billboard Judge Brinkley at one point asked Meek Mill to leave Roc Nation and return to Mack's management. Brinkley has not responded to the recusal motion, Siev claims, and did not speculate on her connection with Mack. He declined to comment on the reported FBI investigation, which is the subject of a second motion for recusal. A Philadelphia court clerk lost her job this week for asking Meek Mill to pay her son's college tuition. Watch the full interview above via Complex.